The first Ford Raptor debuted on the scene in 2010 as the most off-road ready production pickup truck on the market. Unlike the industrial Super Duty trucks, the Raptor looks more like a trophy truck and less like a monster truck. Its upgraded engine, unique body panels, and long-travel springs and shocks set it far apart from the competition. While the rest of the segment was offering skidplates and A/T tires, the Raptor shared only its cab with a “standard” F-150. The all-new 2017 Raptor follows the same formula as the original, but will the sequel be as good as the original? Most sequels are flashier than the original. This Raptor is visually more dynamic with its wide stance and over-the-top lighting. The body seems vacuformed over the chassis, resulting in flared fenders, bulging wheel arches, and body lines stretched taught over the unique hood. The meaty all-terrain tire show off their tread through a unique front bumper. That bumper and the front skid plate sit high in the air, showing off the Raptor’s impressive ground clearance and allowing for a huge 30-degree front approach angle. The Ingot Silver paint on our SuperCab tester nicely contrasted the dark grille, bumpers, wheel arches, and optional wheels. If you need more interior space, the Raptor SuperCrew is also available. The Raptor is not just a trim package. It’s almost an entirely different truck, starting with a unique high-strength steel frame. It has a 6-inch wider track than the original and sits 2 inches higher off the ground. Engineers fitted suspension capable of over 13 inches of travel, almost double the travel of a standard F-150 with FX4 package. 3-inch FOX shocks with integrated hydraulic bump stops handle the work of dampening all the extra articulation and minimizing bottoming-out over harsh terrain. BF Goodrich KO2 tires are mounted to 17” forged alloy wheels with optional bead locks to give this Ford all the traction and durability it needs to handle on and off-road conditions. These are all functional upgrades. An all-new Raptor, with minor modifications for competitive safety, completed the Baja 1000, one of the most grueling off-road races in the world, and then drove home afterwards. It isn’t good enough just to finish the race, however. That means you’ve only build a capable and durable machine. To reach the podium, you need pace and reliability. The 2017 Raptor did away with its massive naturally-aspirated V8 in favor of a high-output version of Ford’s 3.5L EcoBoost engine. The twin-turbo V6 has been upgraded to produce 450 hp and 510 lb-ft torque. That substantial increase results in a sub-5.5 second run to 60 mph! This kind of pace is what helped the new Raptor reach the podium for its class on its inaugural Baja 1000. What’s missing from this new engine, however, is the sound. The previous SuperDuty-sourced 6.2L V8 wasn’t bashful. This new engine won’t turn heads in the parking lot. It sometimes sounds more like a diesel with the turbochargers creating more of the noise than the high-flow exhaust. So while the new Raptor is indeed quicker than the original, it does a much better impression of a vacuum cleaner as well. All great sequels take aspects of the original to new heights. One new aspect of the 2017 Raptor you won’t hear us complain about is the 10-speed automatic transmission. Co-developed with GM and rolling out into the rest of the F-150 lineup for 2018, we were initially skeptical of how it would act. As it turns out, we never felt like the transmission made the wrong decision. The polished metal shift paddles remained largely untouched during our week with the Raptor. Left to its own devices, the 10-speed auto dances through the gears. Sometimes it will shift in straight progression and others it skips a gear or several. No matter what situation you’re in or what permutation of gear change is occurring, there’s never any hesitation or uncertainty from the gearbox. Shifts are crisp, smooth, and quick enough to go largely unnoticed. 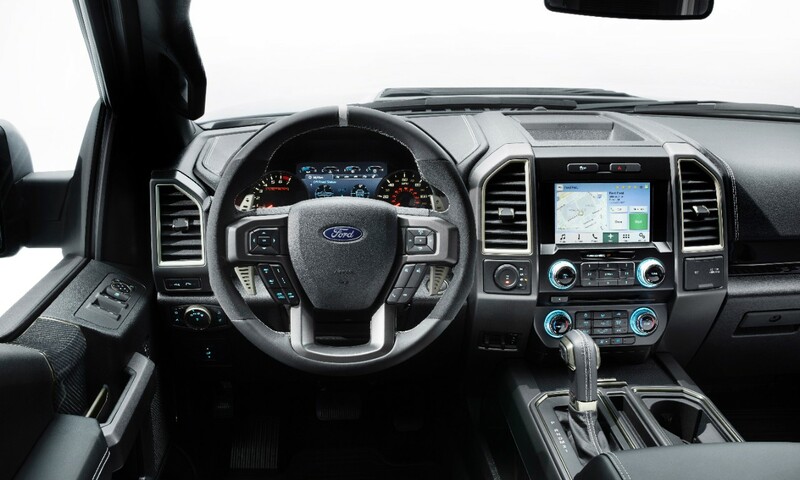 Inside, the Raptor’s interior is largely carried over straight from the F-150. A unique leather wrapped steering wheel with a center-line accent and massive paddle shifters plus the Raptor-branded seats are the only visual cues. Dig into the drive menu, however, and you’ll find options like Mud/Sand, Rock Crawl, and Baja modes to accompany the Normal, Sport, and Weather modes. Those modes automatically change the transfer case, stability control, and traction control settings for optimal traction and control. Each system is also able to be changed or disabled independently for even more options. On the highway, there’s not much that gives the Raptor away from the driver’s seat. The wider track doesn’t have any impact on its road manners and the beefy all-terrain tires don’t make too much noise at speed. Only under hard braking or an exuberant exit ramp would alert you to the Raptor’s slightly less road-focused demeanor. But the chassis quickly settles under braking and goes about devouring whatever terrain might lie ahead. Off-road, the Raptor floats easily over uneven terrain and the occasional groundhog hole. Our foray into an unkempt field for this review’s photos didn’t necessarily require full-time four-wheel drive, but Ford’s Auto 4×4 setting will allow the transfer case to selectively route power forward as necessary. The Raptor’s Off-Road cluster display allows the driver to see the power split in real time. Additional optional features like Ford’s trailer brake controller, 360-degree camera with trailer backup assist and trailer blind spot monitoring make this Raptor well suited for towing. There’s nothing quite like the feeling of towering over everyone at a stoplight or on the highway. And when your full-size truck is capable of impressive speeds on and off the road, the world is your oyster. The Raptor disposes with subtly in favor of an all-out display of force. With the LED headlights and marker lights running across the full width of the front of the truck, there’s no missing a Raptor wherever it goes. And while it might not sound like the old one, it brings the latest features and powertrain technology to be lighter, faster, and more advanced than ever before. So if you’re the kind of person that needs to go literally anywhere and be seen getting there, the all-new 2017 Raptor is exactly the kind of sequel you’re looking for.